The tidal estuary in mid-Pinellas County known as Allen’s Creek and its tributaries, total 6.5 miles in length and drain a watershed of 4,823.3 acres. Allen’s Creek watershed is bounded by Airport Drive on the north, Highland Avenue on the west, and East Bay Drive on the south. 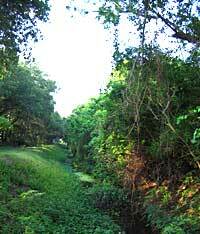 The mouth of Allen’s Creek empties into Tampa Bay about 1/4 mile east of US Hwy 19 & 1/4 mile south of Belleair Road. A new watershed management plan was completed in 2014 with the Southwest Florida Water Management District and the cities of Clearwater and largo. The BMP Report includes nine recommended projects to address flooding and erosion issues in the watershed. These projects will be prioritized for inclusion in the Capital Improvement Program.